After much protestation from fans, Nintendo has dropped the controversial nine-day unlock structure found in its upcoming game, Super Mario Maker. The unlock cycle, which doles out the game's level creation tools over a nine day period to help ease players into its features, will be removed via a downloadable Version 1.01 patch, according to members of the gaming media who've received early retail copies of the game. Players will now have to actually play the game to unlock tools and items, effectively preventing one workaround that let players unlock everything instantly by changing the date on their Wii U systems. Unlock times will be varied, with some reports stating that new unlocks can occur every 15 minutes, while others suggest that some unlocks can take a couple of hours. 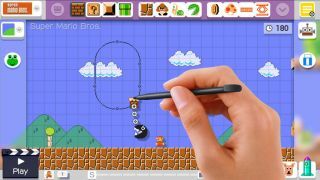 Though players will have to put in some time to unlock everything rather than just wait it out, we expect that this decision will benefit the Super Mario Maker community, as people won't have to wait a whole nine days to play full-featured community levels. Super Mario Maker goes on sale today in the United Kingdom and tomorrow in Australia and the United States.